Available on most welded clevis cylinders. 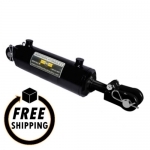 Q.Are repair kits available for welded hydraulic cylinders? A.Yes, we stock repair kits containing the necessary seals for most of the bore sizes for the welded cylinders.